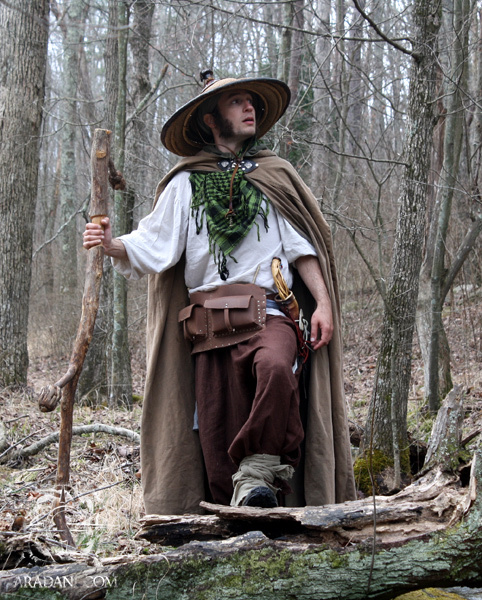 Jarin Plainswalker is a druid who wanders the lands collecting knowledge and artifacts of the fey races. He is a human from the city of Bordon, though after joining the Druid Council he has spent much of his time on the road. His spheres of magic specialize in healing and earth elements, and his knowledge focus is that of the ancient fey races. His knowledge of ancient races surpasses many, and he is valuable in identifying old items, or deciphering ancient scripts. Jarin spent his childhood as the middle child on a farm, uneventful until his bond to magic was revealed. Once accepted into the Druidic Order he spent his adolescence studying in Bordon. He was a difficult student, often spending more time outside the city walls exploring than with his books. As his teachers learned about his personality and adjusted his studies to be less academic and more hands on, he excelled in classes and was sent into the field as an apprentice to Master Ensin. Ensin was a druid who shared Jarin’s wanderlust and together they spent a few years exploring the dangerous swamps in the west. After Ensin’s untimely death to a Unman’s arrow, he was admitted to a special group who were to try and unlock the mysteries of the last age. Though many welcome Jarin when he is around, he has no true home. All he owns he carries with him, though he often leaves copies of his journals and sketches in various hiding places along the road. Visit the World of Uteria website, or Like Uteria on Facebook!